The trash can collects zoo garbage from a tube in an alley. She was somehow able to raise six kids. 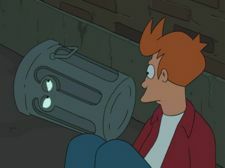 Trash can: You think I'm as worthless as you? Try catching garbage in your head and raising six kids, you dumb townie. This page was last edited on 26 December 2013, at 21:58.